Featuring an ear-clip design, the CP100 headphones stay on even when youre engaged in jarring exercise. Complete with an in-line ReFlex volume control, theres no need to reach for you portable audio player when adjustment is needed. With a wide 20 Hz - 20 kHz frequency response the TRANSAIR drivers boasting 108 dB sensitivity, the CP100 delivers total clarity and ample volume. 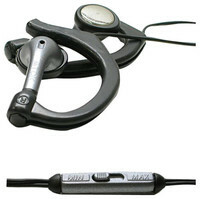 The CP100 headphones include polymer coated earpieces (more comfy than foam) and a 1/8-inch mini-plug, suitable for connecting to portable audio gear.